The X1-Series Awning Balustrade is an extension of the Fascia Fix Balustrade. It incorporates stanchions which extend below the floor level at an angle, away from the fascia, to support the awning panel. This panel with translucent or tinted glass can be used to reduce the amount of direct light and heat entering the lower level as well as providing a level of privacy screening. This system is designed to fix to the face of the balcony structure, whether it be the concrete slab edge or lightweight framing. 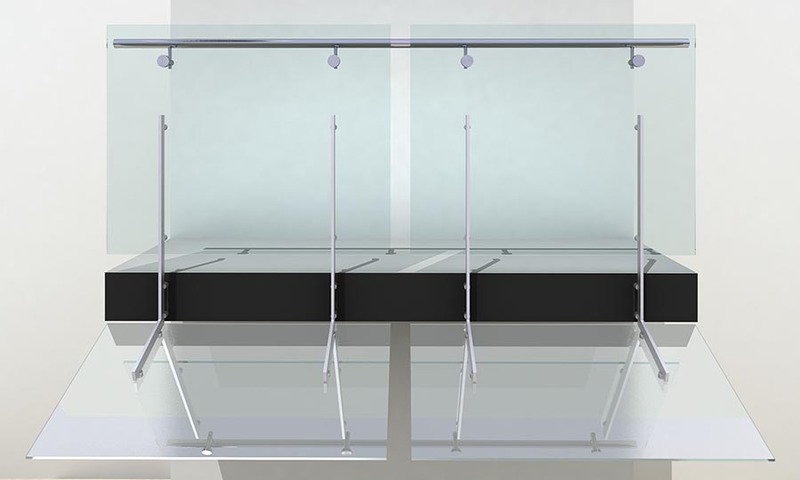 This sunshade balustrade system is suitable for use on; houses, residential buildings and offices with the F485/35 fascia fix stanchion; retail buildings with the F585/35 fascia fix stanchion and; areas subject to overcrowding with the F685/35 fascia fix stanchion. System: THUMP ARCHITECTURAL FITTINGS ‘X1 Series’ – with fascia fixed X1FAWP stanchions with GR38P handrail with toughened glass glazed infill panels. Handrail to be mounted to internal face of glass with glass mounted to internal face of stanchion.